Innova is a student’s take on a turntable-speaker system made from entirely upcycled and biodegradable materials. Holly Jensen, a student of Victoria University of Wellington, had a particular interest in both unusual and environmental product design, pushing the public’s perception of household objects and beautifying items once considered to be obsolete. All the components and fabric of Innova were upcycled, and the glues and wood stains were leftover from previous students’ projects. Software was used to develop the form and layers, a laser-cutter was employed to cut out the plywood, and the machine was hand assembled and finished to ensure a more natural, passionate feel. 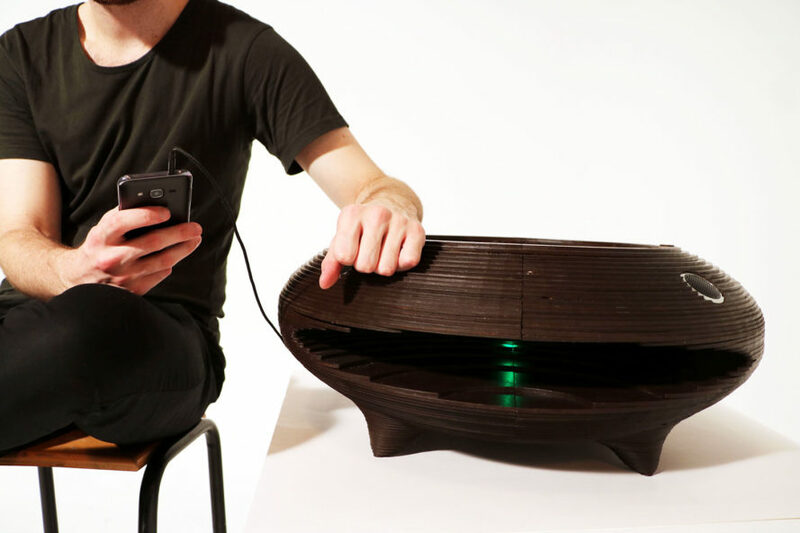 Innova is a student's take on a turntable-speaker system made from entirely upcycled and biodegradable materials. Holly Jensen, a student of Victoria University of Wellington, had a particular interest in both unusual and environmental product design, pushing the public’s perception of household objects and beautifying items once considered to be obsolete. All the components and fabric of Innova were upcycled, and the glues and wood stains were leftover from previous students' projects. Software was used to develop the form and layers, a laser-cutter was employed to cut out the plywood, and the machine was hand assembled and finished to ensure a more natural, passionate feel.